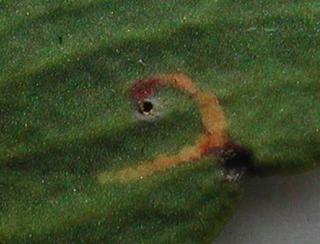 At last, after looking at many leaves, a leaf mine record of Celypha woodiana from VC3! The two pictures attached show a mine found this morning in a clump of mistletoe growing in a large roadside hawthorn bush near Chaceley. This is the part of VC37 that is now in administrative Gloucestershire. The grid reference is SO8431. There is a lot of mistletoe in this area and if it ever dries out some of it along footpaths might even be accessible. A good start to the mothing New Year! GREEN H & MEIKLJOHN J 2000. Mistletoe bugs. Worcestershire Record. 9 page 23.